Your smile is often the first thing that others notice about you, and if you have crooked teeth you may be less inclined to smile. Braces have traditionally been used to straighten teeth over time, but wearing metal braces can be a detriment to your confidence as well as your social and personal relationships. Those who want to improve their crooked teeth in a more subtle way are now choosing clear braces in Fort Washington. At Harmony Dental Health, we offer Invisalign which is a high-tech and modern solution to an improved smile. When looking for Invisalign in Fort Washington, look no further. We offer exceptional care in an environment that you feel comfortable in. Spacing– Typically caused by missing teeth or continuing jaw bone growth, extra space between teeth can lead to periodontal pockets, gum issues, and a higher risk of gum disease. Crowding– Sometimes there is not enough room for all of your teeth to fit correctly. Overtime, this not only aesthetically looks bad but it also results in tooth decay, gingivitis, and plaque accumulation. Overbites– When your upper teeth go over the bottom ones, this can lead to chipped and worn teeth over time. Underbites– Protrusion of the lower teeth can cause TMJ and the wearing down of your teeth. Crossbites– This refers to the misalignment of your lower and upper jaws. This can result in chipped teeth, tooth mobility, and recession of the gums. If you are experiencing any of these conditions, consider Invisalign in Fort Washington for a better looking smile in no time. Better looking– Because they are clear, they can hardly be seen by others. Removable– These clear braces are taken out for eating and dental care, which makes things a lot easier and more hygienic. More comfortable– Not only do you not have metal wires poking into your cheeks, the clear braces are flexible and don’t cause the discomfort that the tightening of metal braces do. Faster Alignment– As opposed to metal braces, which can take two to four years for complete alignment, clear braces take only about 10 to 12 months. If you need Invisialign near Fort Washington or surrounding, call Harmony Dental Health to schedule a free consultation! Here at Harmony Dental Health located in Fort Washington, Pennsylvania, we are proud to offer our patients cosmetic dentistry that improves the way the smile looks, the health of the mouth and the overall function of the teeth. 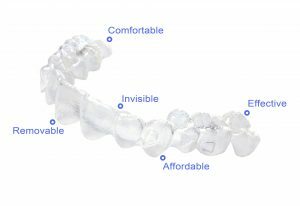 We use Invisalign clear braces to help individuals gain the confident smile they always wanted! Dr. Paola and staff would be happy to sit down with you and discuss your dental needs and how implants can improve your smile. Looking for the Invislaign experts in Fort Washington? Call Harmony Dental Health today!